Microsoft has created an Amazon Web Service AWS Azure Service Map. The AWS Azure Service Map is a list created by Microsoft looks at corresponding services of both cloud providers. 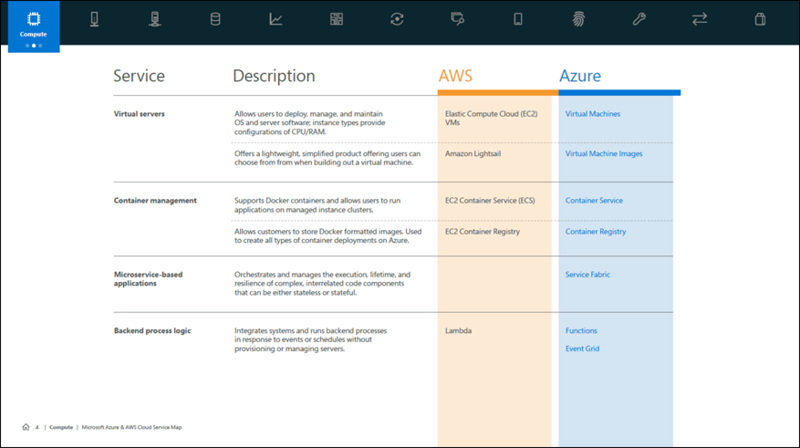 Note that this is an evolving work in progress from Microsoft and use it as a tool to help position the different services from Azure and AWS. Also note that not all features or services may not be available in different regions, visit Azure and AWS sites to see current availability. As with any comparison they are often dated the day they are posted hence this is a work in progress. If you are looking for another Microsoft created why Azure vs. AWS then check out this here. If you are looking for an AWS vs. Azure, do a simple Google (or Bing) search and watch all the various items appear, some sponsored, some not so sponsored among others. Down load a PDF version of the service map from Microsoft here. On one hand this can and will likely be used as a comparison however use caution as both Azure and AWS services are rapidly evolving, adding new features, extending others. Likewise the service regions and site of data centers also continue to evolve thus use the above as a general guide or tool to help map what service offerings are similar between AWS and Azure.